Being able to extend the rest period of the pasture country. It is certainly very clear to us that the omsb takes moisture from deep in the soil. We very rarely see water running of our saltbush paddocks now, every bit is soaking in to be used later. The diversity of grasses coming back between the rows is encouraging. We havent needed to handfeed during late summer and early autumn. That saves us bi money. Our other grass paddocks are becoming more productive because of the ability to be able to de stock at strategic times. Providing ground cover all year and allowing the return of a strong biological diversity  including that of insects along with the associated small insect-eating birds. None observed so far except for getting the grazing management right. Do you / if you had a salinity problem, do you think OMSB would help with controlling deep drainage and/or lowering the water table? Yes it does. Would you like to increase your area sown to OMSB? We plan to keep planting it in the future. What limits your planting of a larger area? Our cropping program and economic returns from livestock. 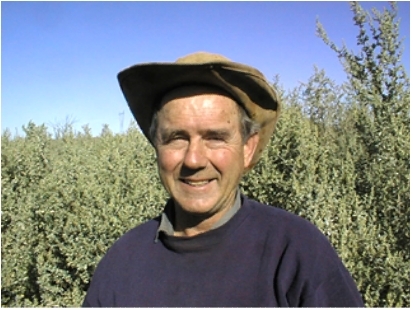 Garth & his family were one of the first properties to plant extensive areas of oldman saltbush in the Narrandera area. It has been very rewarding for us to watch the benefits that Garth has gained from having omsb as a backbone to his grazing, particularly during the last drought.